Floating pond plants are unusual in the plant world because they don’t grow with their roots in the soil like other plants. Their roots hang down into the water and the rest of the plant floats on top like a raft. If you’re looking to decorate your backyard water feature, floating plants for ponds can give the area a cool, natural look with very little effort. In fact, these plants are so carefree that many of them should be thinned each year to prevent them from overtaking the local water system. What are floating plants? This unusual group of plants takes all their nutrients from water, bypassing any need to have their roots in soil. They’re often food for local wildlife, like duckweed, or provide protected spaces for fish spawning, like parrot’s feather does. Water lettuce and water hyacinth are two of the best-known varieties. If you have a larger pond or another enclosed body of water, learning how to use floating plants can go a long way toward your man-made feature look more natural. Depending on the size and type of your water feature, the types of free floating water plants vary greatly. If you’ve got a small pond that’s only a couple of feet deep, water hyacinth flowers will set off the surface of the water beautifully. Larger homestead ponds can benefit from the various forms of duckweed, especially if you’re trying to entice waterfowl to your property. If your pond empties into streams or other bodies of water, beware of some of the more prolific floating water plants. Water hyacinth is highly invasive in some parts of the country and should never be planted where it can spread to streams and into lakes. 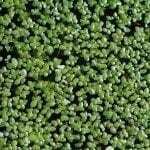 Salvinia and water lettuce can create the same problems of growing into a large mat, keeping sunlight from the lake bottoms and using all the oxygen in the water, killing off fish and wildlife below. Always check with your local extension service before planting a new species in ponds that empty into the water supply. What began as an attractive addition to your landscaping can turn into an environmental problem in a matter of one season, if you choose the wrong plant to use. NOTE: The use of native plants in a home water garden (referred to as wild harvesting) can be risky if you have fish in your pond, as most natural water features are host to a plethora of parasites. Any plants taken from a natural water source should be quarantined overnight in a strong solution of potassium permanganate to kill any parasites prior to introducing them into your pond. That being said, it is always best to obtain water garden plants from a reputable nursery.